As a sport, long distance running distills excellence as much as possible to the category of human effort. Long distance running requires endurance, by which we mean the ability to suffer. We admire good runners because of their ability to run fast, win competitions, etc. In this sense, running is like other sports: we admire elites because they represent the outer limits of human achievement. When it comes to the specific type of achievement that distance running represents, however, the simplicity of running reduces the skill factor to the minimum. Ours is an endurance sport, and as such the currency of achievement in running is pain. One thing that is strange about pain, however, is its immediacy. With respect to our own pain, it is difficult to find distance from it in order to take it up reflectively. This is why the experience of pain is always difficult to recall in its full intensity. We look back on a race and say: hey, that wasn't really so bad. But if it wasn't so bad, why didn't I run faster? This phenomenon, by the way, explains why we continue to sign up for marathons--Frank Shorter, I believe, once said that he couldn't race a marathon until he had forgotten completely what it was like. In a way, we can't know our own pain because we can't get intellectual distance from it; we only feel it as present to us in a particular moment. The pain of others is of course even more difficult to imagine. Pain always has to be expressed indirectly through signs and signals. People scrunch up their faces to demonstrate effort. Their eyes perhaps lose their focus on the outward world, as the pain absorbs all of their attention. We have to read the pain of our competitors or our teammates on their bodies, but the text we read never seems to bring forward the actual object. We imagine some runners to be tougher than others, as they seem to physically exude effort. Others show no outward sign of pain, making the sport look easy. But is the first sort of runner hurting worse, or is he just more demonstrative? We can't know because we don't experience the pain itself, just its signs. Roger Bannister, breaking the 4:00 barrier also appears to be courageously confronting his capacity for pain. The difficulty here is that in order to be communicated, pain must be expressed. However, pain by its very nature is immediate--and as soon as it is expressed, it is transformed into something that is not pain--a facial expression, a cry, a failed motion. We have to interpret these marks in order to understand the nature of pain, and we can go wrong. The upshot of this is that experiencing pain--whether it is your own pain or the pain of another--requires intelligent interpretation of its marks. One thing that is striking when watching a race is the difference between how the leaders of a race and those in the back or middle of a race handle the experience of pain. A runner like Bekele or Gebrselassie shows almost no sign of pain, even though they are not only at the limit of their own performance, but at the limit of human performance. It would be absurd to conclude from this that they are feeling no pain; we should marvel instead at the intelligence with which they respond to the pain they feel--expressing pain would be a waste of energy and a clue to opponents. When it comes to dealing with the pain of running, we more ordinary folk face the same challenges. The most difficult thing in running is to read our pain: what exactly does it mean? As I go through a training cycle and get in better physical shape, I also seem to begin to be able to identify more clearly the difference between real pain and imagined pain. The pain gets more nuanced and communicative. Familiarity breeds comfort, and though I feel the pain, I get better at controlling my reaction to it. I think that through the years, I have learned that much of the "hurt" of pain has to do with fear. The sensations that hurt the worst are the newest: we don't know what they mean, we don't know how to respond to them, and we don't know therefore how to mediate them. This lack of knowledge brings fear and lack of control, and the sensations come crashing in on us with all of the immediacy that makes pain so, well, painful. But over time and through familiarity, we learn to adapt to them and to run on in spite of them and through them. Some of the sensations that were at first painful later, oddly, even become pleasures. There is a larger lesson in here, I think, about the human response to suffering. Distance running teaches us that we have the ability to adapt to it, to ignore it, and even to take pleasure in it. While these are essential responses to our own suffering, it is easy to see how our ability to adapt to the presence of suffering can also be a problem politically and socially. Being ethical requires two opposite attitudes. We ought to be as indifferent as possible with respect to our own pain and suffering, but when it comes to the suffering of others, we ought to notice it and respond to it. As opposite as these reactions are, they are united in the sense that both require courage--an active and fearless relation to our own suffering and the suffering of others. Is a capacity to feel pain, that is, not to ignore it but to treat it, deal with it, encounter it, at the heart of ethics? 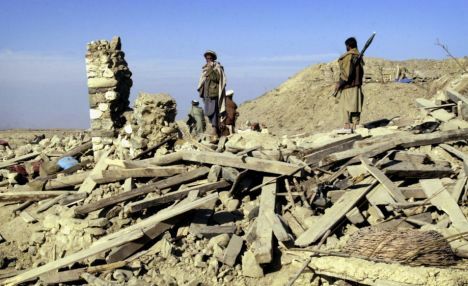 Villagers stand by a bombed settlement in Afghanistan. By creating conditions in which human beings can safely encounter suffering, sport teaches us that the presence of courage distinguishes a noble encounter with suffering from an experience of suffering that diminishes life. We don't run in order to experience pain. We run to practice courage in the face of pain. 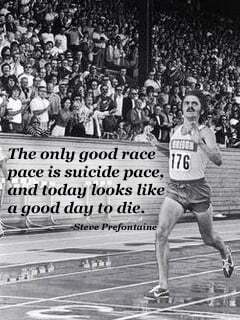 You might say that a race is a sort of celebration of the possibility of courage in the face of pain. As for whether running and racing teaches us to be more ethical people, I suppose this depends upon our capacity to generalize this courage and to extend it beyond the artificiality of organized sport into the more uncertain spheres of ordinary life. More than any classroom, sport educates us into how to respond to intensities of feeling, the immediate qualities of experience. It is hard to call this sort of response "knowledge," but it is certainly a type of intelligence, one that is perhaps underrated in this angry 21st century. "Familiarity breeds comfort"... what an intriguing theme. speaking of intriguing - pain's utter internalness (internalness??) intrigues me. i have run around on a broken ankle. did it hurt? well, yeah, sure. did it stop me from running? well, no. it didn't hurt that bad. i'll get teeth drilled sans novocaine. does it hurt? well, sometimes yeah, but it's over really quickly. what intrigues me is to wonder if someone else would withstand easily the amount of pain that i do, and then, if someone else would pass out from the pain. like kids in the backseat hitting each other to see who can make the other flinch first. or, something. i mean, if i say that the broken ankle hurt like being poked continually with a sharp stick - even that wouldn't place it on your pain meter.